Oscar®-winning director Fernando Trueba and Spain's most famous and successful designer Javier Mariscal celebrate their passion for the music and culture of Cuba with an epic story of love, passion, and heartbreak. Cuba, 1948. Chico is a young piano player with big dreams. Rita is a beautiful singer with an extraordinary voice. Music and desire unite them, but their journey - in the tradition of the Latin ballad, the bolero - brings heartache and torment, as they chase their dreams and each other from Havana to New York to Paris and Las Vegas. 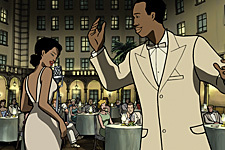 With an original soundtrack by legendary Cuban pianist and five-time Grammy®-winning composer Bebo Valdés, "Chico & Rita" captures a defining moment in the evolution of jazz and history and features music (and animated cameos) by Thelonious Monk, Charlie Parker, Cole Porter, Dizzy Gillespie, Woody Herman, Tito Puente, and Chano Pozo.